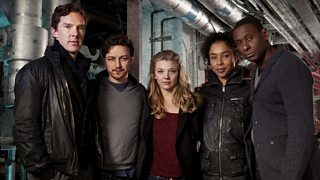 Well here is a Christmas treat - albeit quite a dark one – instead of the 12 days of Christmas, Radio 4 are doing the six nights of ‘Neverwhere’, which was a hit for BBC Radio 4 Extra & BBC Radio 4 the earlier this year. Originally broadcast across the two networks, this will be the first time that every episode of the hugely popular series by Neil Gaiman will be on BBC Radio 4. The six-part adaptation starts on Radio 4 with a 60-minute episode at 11pm on Christmas Day - Wednesday 25 December - and continues with five 30-minute instalments on consecutive nights at 11:30pm, Thursday 26 to Monday 30. I knew we had commissioned something special when I visited the readthrough – Dirk Maggs (director) and Heather Larmour (producer) were presiding over a gathering of actors which had more star names than a Hollywood red carpet on Oscar Night – at one end of an enormously long table sat Star Trek’s Khan, Benedict Cumberbatch, who plays The Angel Islington, at the other end was Lord of the Rings’ Saruman, Christopher Lee, who at 90 was making his radio drama debut playing the The Earl of Earl’s Court and sandwiched in between were X Men’s James McAvoy, playing our hero Richard Mayhew; Homeland’s resident baddie David Harewood (Marquis de Carabas), Game of Thrones’ not to be wholly trusted Margaery Tyrell (Natalie Dormer plays Door), the even less to be trusted Maggie in BBC1’s current hit The Escape Artist, Sophie Okonedo (Hunter), Buffy’s Watcher Rupert Giles, Anthony Head (Croup), as well as Johnny Vegas, Bernard Cribbins... even author Neil Gaiman was playing a part. From TV show to novel to radio adaptation, Neil Gaiman on how Neverwhere came to radio. Radio 4 quiz: Who killed Doctor Who?